Today the U.S. military is more nimble, mobile, and focused on rapid responses against smaller powers than ever before. One could argue that the Gulf War and the postwar standoff with Saddam Hussein hastened needed military transformation and strategic reassessments in the post-Cold War era. But the preoccupation with Iraq also mired the United States in the Middle East and led to a bloody occupation. What will American strategy look like after U.S. troops leave Iraq? 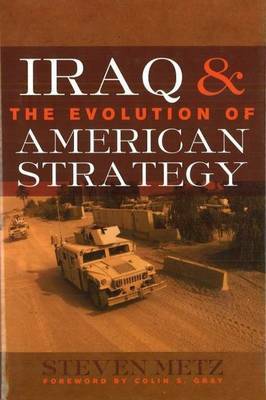 Iraq and the Evolution of American Strategy examines the ways in which the Gulf War, the WMD standoff, the Iraq War, and the ongoing occupation have driven broader changes in U.S. national security policy and military strategy. Steven Metz answers three overarching questions: 1. How did the conflict with Iraq drive and shape broader changes in national security and military strategy? 2. Did policymakers and military leaders interpret the conflict correctly and make the most effective responses? 3. What does this process tell us about the process of change in America's national security and military strategy and in the evolution of its strategic culture? Metz concludes that the United States has a long-standing, continuing problem"developing sound assumptions when the opponent operates within a different psychological and cultural framework." He sees a pattern of misjudgments about Saddam and Iraq based on Western cultural and historical bias and a pervasive faith in the superiority of America's worldview and institutions. This myopia contributed to America being caught off guard by Saddam's invasion of Kuwait in 1990, then underestimating his longevity, and finally miscalculating the likelihood of a stable and democratic Iraq after he was toppled. With lessons for all readers concerned about America's role in the world, Dr. Metz's important new work will especially appeal to scholars and students of strategy and international security studies, as well as to military professionals and DOD civilians. With a foreword by Colin S. Gray.